The getsix® e-Service Mobile Extranet service for iPhone and/or iPad equips employees with greater productivity in the field. Sales and accounting staff are able to get information quicker, collaborate more easily and be far more responsive to your internal requirements. getsix® realises businesses require ways to enhance productivity, to empower ‘your staff and with security’. Please let us introduce our solution which allows you to get finacial and human resources data on your mobile device. It may be especially usefull during the business trips and on the business meetings which you probably attend a lot. Expectations have changed. Business now wants the latest information to make quick and accurate decisions on the move. getsix® understands this and tailors each stakeholders needs and helps to balance them within your company. USE THE getsix® MOBILE EXTRANET SOLUTION FOR iPHONE AND iPAD, AND BE EVERYWHERE, RIGHT NOW! A secure, robust and easy-to-use solution for accessing, viewing, editing and syncing your business information on iPhone and iPad. The getsix® e-Service ‘Mobile Extranet’ service for iPhone and iPad equips employees with greater productivity in the field. Sales and accounting staff are able to get informations quicker, collaborate more easily and be far more responsive to your internal requirements getsix® realises businesses require ways to enhance productivity, to empower ‘your staff and with security’. Award-winning mobile Colligo Briefcase applications, solve the SharePoint mobility challenge by providing secure access to your data, via our getsix® Customer Extranet environment on Apple iOS. Colligo Briefcase provides more productivity tools to your iPhone and iPad, with full offline support, advanced metadata support, with industry leading sync and security capabilities. WITH THIS SOLUTION YOU CAN GIVE, FOR EXAMPLE, YOUR SALES PEOPLE ACCESS TO THE LATEST ‘PRICE LISTS’ USING THEIR iPHONE AND iPADS. Colligo Briefcase applications, can be purchased, or downloaded from the Apple App Store on your iPhone and iPad. It is available in two versions: FREE Briefcase Lite for iOS or the Briefcase Pro for iOS. To get connected with the getsix® ‘Customer Extranet’ server the FREE version can provide this. Expectations have changed. Business now wants the latest information to make quick and accurate decisions on the move. getsix® understands this and tailors each stakeholder needs and helps to balance them within your company. Please let getsix® introduce our solution which allows you to get financial and human resources data on your mobile device. It may be especially useful during the business trips and on the business meetings which you probably attend a lot. End-to-end data encryption between your device and the getsix® data centre, along with password policies enforcement. YOUR BUSINESS INTELLIGENCE ON YOUR iPHONE AND/OR iPAD WHEN YOU NEED IT – Please click, learn more! MAKING MOBILE USERS MORE PRODUCTIVE WHEN USING THEIR DEVICES – Please click, learn more! 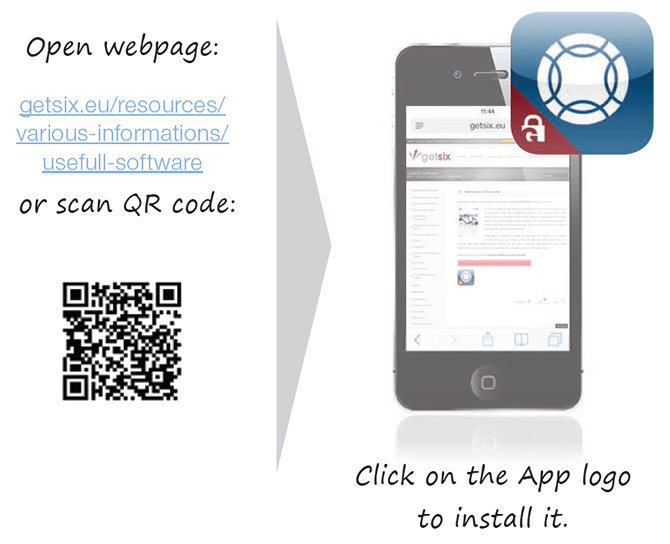 YOU CAN DOWNLOAD A FREE OR FULL VERSION FROM THE APP STORE ON iPHONE & iPAD – Please click, learn more! Why we decided to offer getsix® Mobile Extranet solution? If you are our customer using either of our solutions for Finance & Accounting. And/or HR & Payroll, and/or Office Management, we store your relevant monthly data, and/or reports (i.e. Profit & Loss, Management Accounting Reports etc.) on our getsix® ‘Customer Extranet’. getsix® ‘Customer Extranet’ solution is based on Microsoft SharePoint technology and can be accessed from any internet connection 24/7, and with any internet browser. 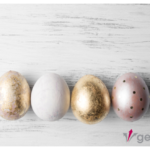 getsix® customers have also the possibility to upload their files which are not connected to our services, by using our getsix® Customer Extranet as your hosted document management system. The application also provides more productivity tools to your iPhone and/or iPad, with full offline support and advanced metadata support. getsix® Mobile Extranet provides you with all your monthly reports prepared and uploaded by our Accounting Department, and/or HR/Payroll Department/s, via your iPhone and iPad. We provide you with standard reports or we can also customise them to your specific requirements. If you are interested in specific reporting based on the needs of your company, we can offer help and advice. Being able to easily share files is a double-edged sword. It also potentially invites leakage of sensitive corporate content – often inadvertently. getsix® gives your business the power to restrict what can be shared externally by disabling sharing capabilities to specific users, completely specific to your requirements. Just open the App and check the latest fi nancial reports for your company, wherever you are. A clear menu structure guides any stakeholder through, meeting each individual’s requirements. 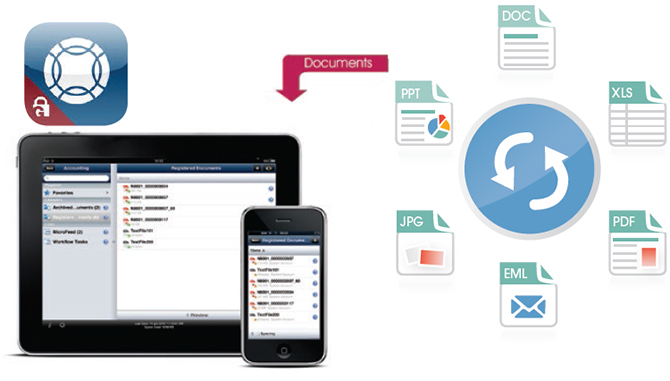 What does getsix® need to consider in a Mobile Extranet client to ensure that your business users are more productive? A sales representative, who spends the majority of their time on the road, travelling between numerous short appointments visiting potential/existing clients. You want to show sales presentation, check spec sheets and access your price list. Now the whole sales team has been issued with iPhone and iPad, so they are free to travel light. Clients and prospects seem to respond well to materials presented on these devices. 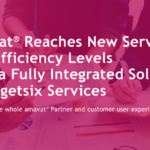 For example – business intelligence, electronic document management, vendor invoice scanning, monthly reports, balance sheets, sales and marketing materials are already stored via getsix® Customer Extranet. Much of this material is highly sensitive information and must be secured against leakage to competitors’. With new information constantly being published, data entry can be linked to backend workfl ow, saving time! It is crucial that everyone has the latest supporting data. Pricing and promotions change frequently, so sales staff need to have latest details. Accountant – during a meeting you need to quickly look at the latest Income Statement. Using getsix® ‘Mobile Extranet’ you can do it directly on your iPhone and iPad, without leaving the meeting or relaying on others to provide the information. Controller – a colleague in the field requires a monthly cost report for a meeting. Using getsix® ‘Mobile Extranet’ they can access themselves. Employee/HR Dept. – a current list of sensitive personnel and all related costs are required. 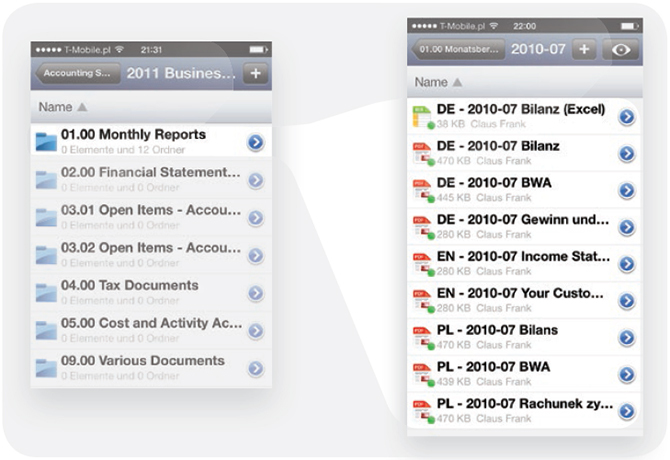 They can take advantage of getsix® reporting via iPhone and iPad. Employee/Site Manager – a problem has arisen out in the field, which requires your urgent attention. You have uploaded photos using getsix® ‘Mobile Extranet’ to the getsix® ‘Customer Extranet’ portal via your iPhone or iPad, alerts then are sent to relevant colleagues, to enable fast and precise conclusion for the client. Manager – normally you would print out getsix® monthly statements to take it to a meeting, or check on your laptop. You can now use getsix® Mobile Extranet to your iPhone and iPad, thus eliminating paper based forms and more simple. COLLIGO BRIEFCASE APP CAN BE DOWNLOADED FROM THE ‘APP STORE’, WITH LITE VERSION FREE. Detailed information can be obtained from the application developers: www.colligo.com or directly on the application: Usefull software. Proceed similarly for iPhone and iPad. After installation log-on to getsix® ‘Customer Extranet’ and find pre-defined standard reports ready to use. 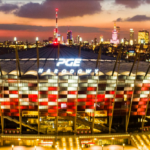 Please contact us so we can provide for you customize offer for getsix® ‘Mobile Extranet’ Services: office@getsix.pl. You will be given detailed information about how to connect, with simple installation instructions. The whole process should be no longer than 5 minutes.